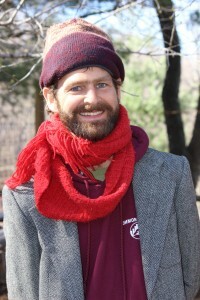 Tim has been working as an environmental educator at Common Ground since 2011. A native of Middletown, CT, Tim worked for over a decade with Oddfellows Playhouse Youth Theater there. While primarily an Artist with the Summer Children’s Circus, he also worked as a theater teacher for children in public housing as well as those as young as 18 months. His work with children has taken him all over the world, from Maine to Ecuador to Bali. In 1999, an apprenticeship at a small farm in Wisconsin sparked his passion for organic gardening and beekeeping. Thus began a shift in focus over the last decade from the Arts to the Environment in his work with children. Tim loves to lead and learn from children in the garden doing work, watching pollinators, and investigating with his loupe; off on a hike telling stories, checking out mushrooms and identifying new plant friends; and watching the bees come and go at the hives while answering any and all questions about them. When not at Common Ground (or some far flung place on the globe), Tim can usually be found riding his bike, exploring the woods, or at home cooking, baking, fermenting and meditating.